Bali is one of the most beautiful tourist spots in Asia. Bali has 1,000,000 the end of the whole world. Bali lies between the islands of Java and Lombok. Bali is a small island which has an area of ​​140 km from west to east and 80 km from south to north. Bali province is divided into nine districts (eight counties and one city) with its own capital. Buleleng covers an area of ​​1365.88 km2, or approximately 24% of the land Bali. Jembrana covers an area of ​​841.80 km2, or approximately 14.94%, Karangasem 839.54 km2, or approximately 15% of the land of Bali, Bandung 420.09 km2, Denpasar 123.98 km2, 368 km2 of Gianyar, Klungkung 315.00 km2 and Bangli 520.81 km2, or approximately 31%. Pollution in Bali is nearly 3.6 million. Bali was among a series of volcanoes that runs from west to east that is Mount Volcano, which last erupted in 1963. It is located only 8-9 degrees south of the equator, Bali boasts a tropical climate with two seasons (wet and dry temperature of around 28 C). The south area is a wide area and there is a leaning rice terraces which became the most famous places in the world. The agricultural product in the hill north coast is coffee, copra, spices, vegetables, rice and livestock. Bali has a very hard spiritual tradition, although many tourists visited Bali all years, but do not change the culture and traditions that exist in Bali. Hinduism is the main religion in Hindu Dharma, which formerly came from India. 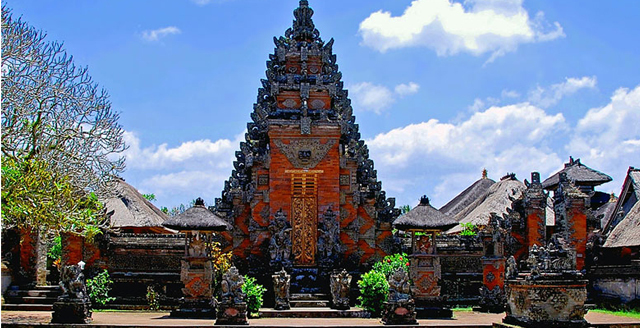 However religious in Bali is different from the religious in India as in the Bali Regional been fused with their religious customs of ancient tradition. Bali has a certain number of temples that serve as a place pray Hindus. Each house has a shrine as a place to worship Hyang Widhi and their ancestors, so that there are thousands of temples in Bali. Rituals and ceremonies performed nearly every day of the 5 main ceremonies, which the tradition to God, Ancestors, Imam, ritual human life or evil spirits. The most famous tourist area of ​​Kuta which is well known since 1970 for its beautiful beaches with white sand, places to surf, and can see the sunset view. Kuta is the fourth main objectives of the tourist. There are many hotels, shops, restaurants and bars in Kuta. For those who seek tranquility and peace, they usually chose a quieter resort of Sanur, Candidasa and Ahmed on the east coast. In the southernmost peninsula of the island, there are many five-star hotels with international quality. The village center of Ubud, in the hilly region of Gianyar is also grow as a tourist attraction and now is regarded as a center of art and culture. People retreat is limited to the social aspects to the tradition of growing or obligate to worship God through a temple particular, the obligation to worship God through the family temple or shrine society, ownership of the property attached belong to particular Subak (irrigation system in Bali), for social status based on varna, for close relations in line with systematic part lineal, for a certain group membership, to an official administrative districts. Various traditions and cultures into one of the advantages possessed by the island of Bali that can attract many tourists from all over the world.